A common sight around our garden at present is the little spider pictured left. 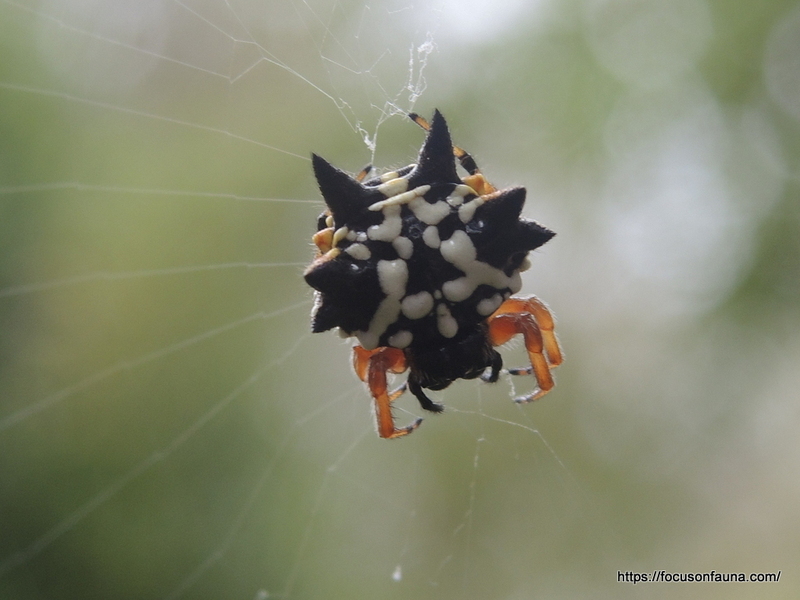 It’s a Jewel Spider, Austracantha minax, also commonly known as Spiny Spider or Christmas Spider (supposedly because it’s most numerous around Xmas time). It looks like a cake decorator has been busy with the icing bag on its back, and its underside is also colourfully patterned (see below, right). The Jewel Spider belongs to the orb-weaver family Araneidae. 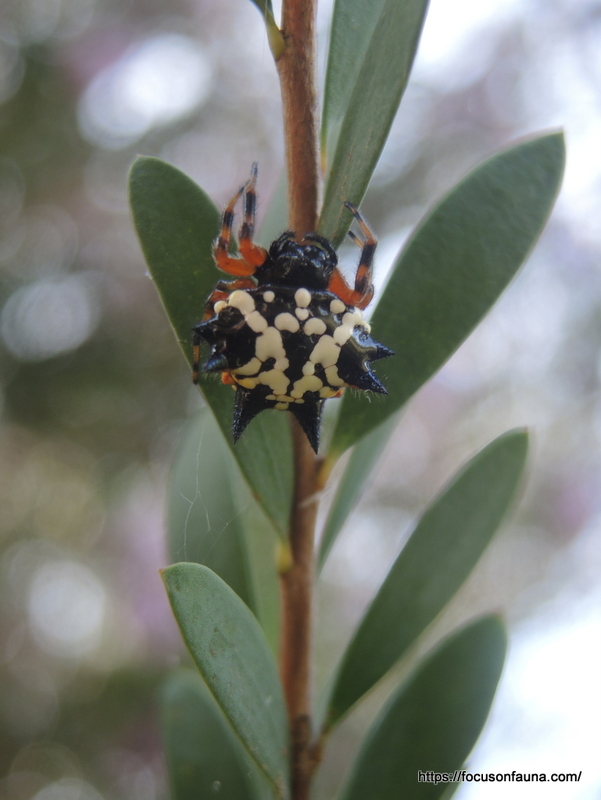 It is the only member of the genus Austracantha and is endemic to Australia. All the ones we have found lately have been solitary, but it is common for them to hang out in groups, building extensive intertwining webs, presumably to improve the chances of prey capture, but proving a curse to bushwalkers. The female (pictured) is larger than the male and spends her time sitting at the centre of her spiral web. Unlike some other orb-weavers, the web is relatively permanent and not rebuilt every day. 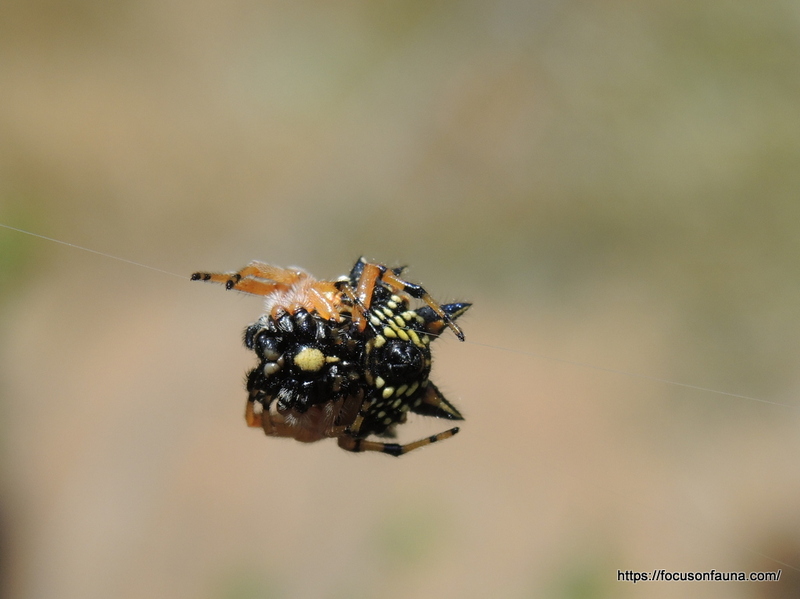 The Jewel Spider has an interesting ploy to improve the web’s durability – it adds white silk tufts at intervals along the main support and anchor threads (see web photos below) to increase their visibility to larger animals so they are less likely to go barrelling into the web. The rest of the web is very fine and near invisible to the spider’s prey of small flying insects. So keep an eye out for this little jewel, if only to avoid getting tangled in its web.